The preservation of Lichgate on High Road has been a task undertaken by a many over the hundreds of years the Lichgate Oak has sunk its roots into this small corner of Tallahassee. We often speak of Laura as being the first preservationist, and she was the one to give it a recorded name, but the Oak has had many guardians, some known, and some lost to mists of time. This page will attempt to document what we know about the property but there are gaps and research continues as with so many of the stories surrounding Lichgate. We know only a small amount about the current property prior to Laura making it her home. 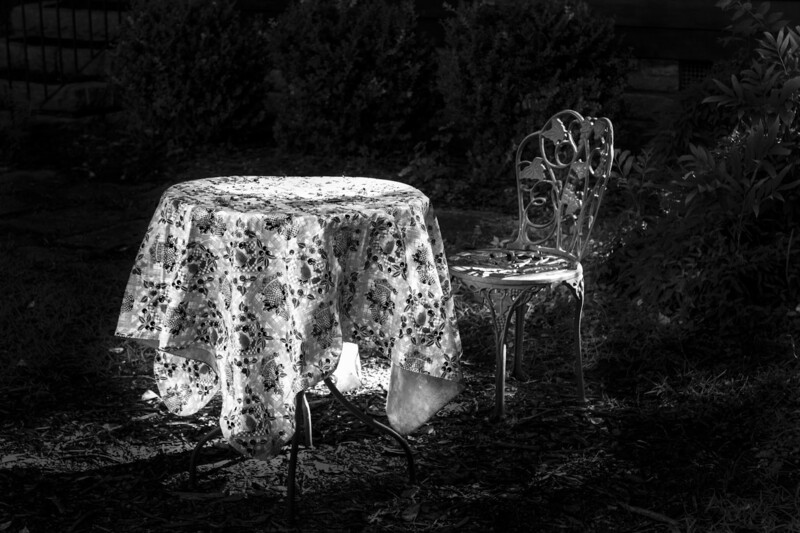 From her final book, Lichgate on High Road, she tells us that she spent two years walking around the area surrounding the Florida State University campus saying in Chapter 4, "But this was not the only site I considered. For two years I walked in every direction, through woods, in fields, around lakes, within a radius of a dozen miles of Tallahassee. And if squatter’s rights had given me claim to all the land I visited, I would have taken possession of many acres. 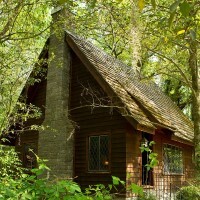 Each place I considered a site for a house, but always I returned to the pasture at the foot of High Road, climbed the barbed wire fence, pushed aside dense foliage of myrtle, mimosa, chinaberry, and undergrowth of dewberries and blackberries, and came to a grove redolent of pine saplings. From every angle I viewed the live oak, always in leaf and always beautiful, with resurrection fern climbing its huge branches. At length I selected for my house a spot which would command a view of the tree as an unbroken arch against the sky. There in 1955, I decided to build my house." 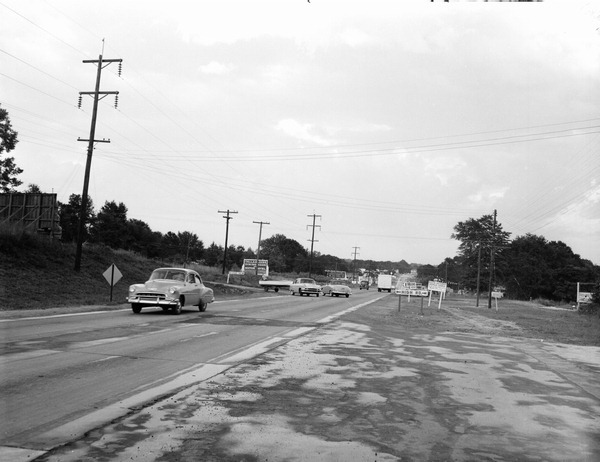 The picture to left shows how the High Road and Tennessee Street intersection appeared in August, 1955. This is the road Laura would have walked up to find her tree. This search for a homesite echoes the wanderings of Thoreau as recorded in Chapter 2 of his great work, Walden where he writes, "AT A CERTAIN season of our life we are accustomed to consider every spot as the possible site of a house. I have thus surveyed the country on every side within a dozen miles of where I live. In imagination I have bought all the farms in succession, for all were to be bought, and I knew their price." So how did the property appear before Laura arrived and how did the tree survive? We have aerial photos from both 1941 and 1954 showing the Lichgate Oak in the corner of what was then a field. 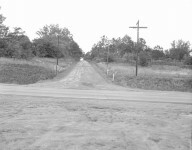 To the right is the one from 1941, to the left the one from 1954, in both the oak is circled. 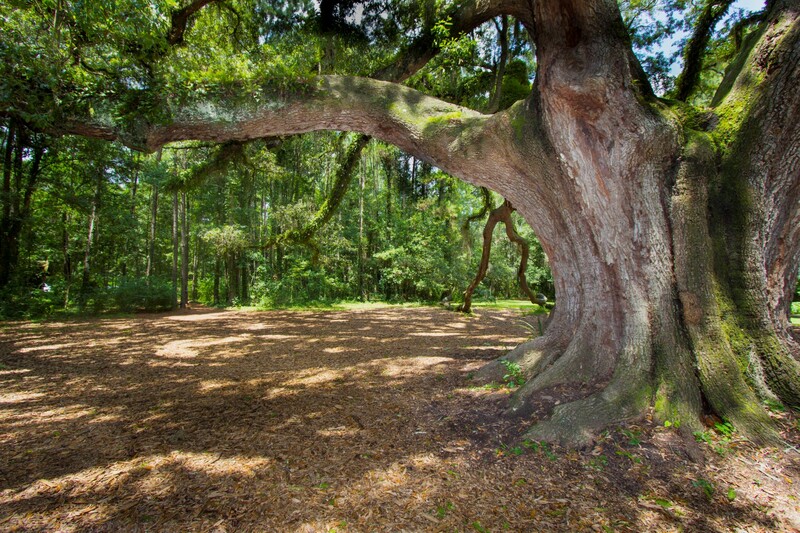 Laura continues in Chapter 4 writing, "But with the grace of a southern belle in a billowing skirt, this moss-draped live oak swept the ground in every direction. It was a tree to inspire poets. “The soft green leaves dangle all around me,” wrote Walt Whitman, resting in the rain under a live oak. Because the tree in this pasture had been saved to shelter livestock from the southern sun, it stood unhampered and alone, symmetrical on the site." From here we see that one the earliest guardians of the tree were simple cattle living on the site. To see more aerial photos of the growth surrounding Lichgate visit the the Audio/Visual Tour page of this site and look for the section entitled View to the Past. "To purchase the acres I had to arrange a loan. I went to the bank, “I am going to buy a tree,” I said. “A what?” asked the surprised official. “A tree on High Road,” I answered, more specifically. “Are you an art teacher?” he inquired. He could think of no one more impractical. I left the bank without a loan. The official is now president of the bank. A friend lent me five thousand dollars and in 1956, I was ready to begin peopling my place with the spirits of Merrie England." This purchase was a bit unusual. Laura purchased the three acres from a group of people who represented a Church called Capital City Freewill Baptist. Among the group was Mr. Marvin Collins, the father of what would later be the governor of Florida, LeRoy Collins. The site near the oak was to have been the home of Church apparently and the restrictions placed on the purchase as reflected in the deed show the group cared about the preservation of the property. 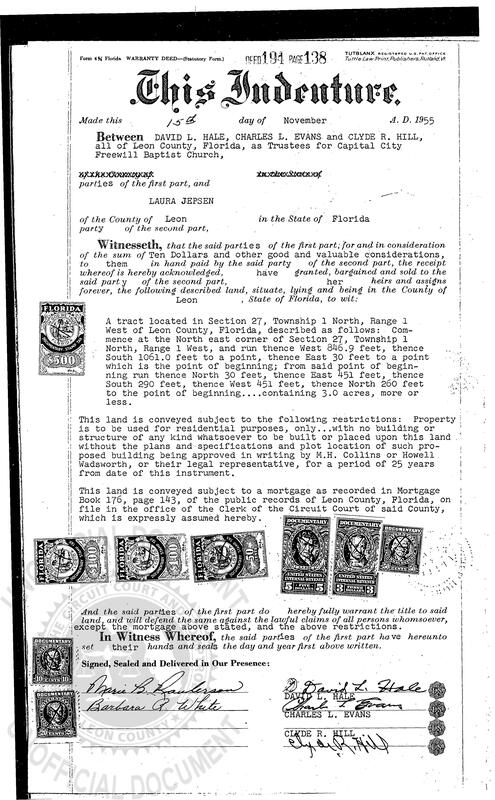 It appears that the Collins family was involved in dividing up just over 157 acres of land around the Tharpe Road area of Tallahassee and formed partnerships with some of those who would later sell the present property to Laura. 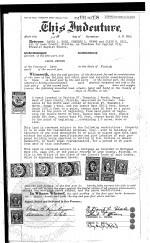 You can trace a history of this through the various papers filed with Leon County, April 30, 1946 September 26, 1947 and April 8, 1957, (PDF documents). At Laura's death on December 24, 1995, her will stipulated that the various properties she owned pass to the care of the organization known as The Nature Conservancy. These properties included Lichgate on High Road, her cabin in North Carolina with its surrounding wildflower preserve and a section of farmland in Iowa that Laura had restored to prairie. 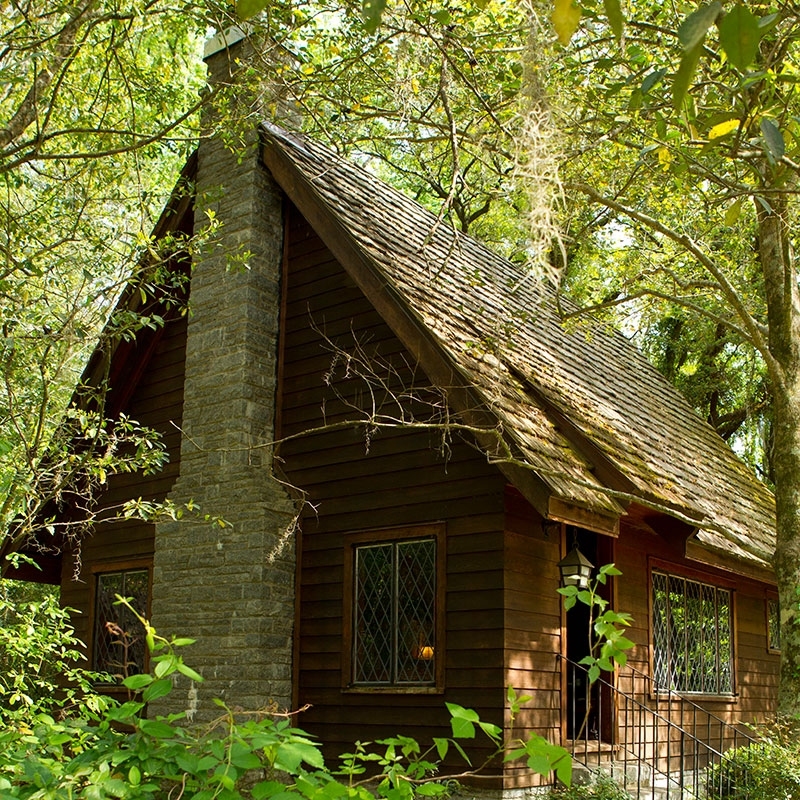 The cabin in the Blue Ridge Mountains was sold and remains in private hands while the 160 acres left to the Conservancy in Iowa was parceled out, most sold to the farming family next door and the remaining 28 acres set aside for protection. The fate of Lichgate hung in the balance for some months after her death. Various organizations sought to preserve the property including the Southern Shakespeare Festival and an article from the January 20, 1997 article in the Tallahassee Democrat details that struggle, Page 1 Page 2. Lichgate on High Road entered into the National Registry of Historic Places on March 31, 2006 (PDF). Unfortunately Lichgate's future is far from certain. During September 2015, an initative was launched by members of the Board of Directors of the Laura Jepsen Institute to privatize the property. These efforts were undertaken by the Davis family who achieved domaince of the Board and improperly enacted changes to both the Articles of Incorporation and Institute Bylaws to ensure that officers of the Board could serve unlimited terms, removed provisions for public membership in the Institute and public attendance at Board meetings as well as elimination of financial oversight by eliminating outside audits of the Institute. With control of membership, money and outright banning of members of the public deemed not in line with the new Board direction, Lichgate on High Road has now passed into the control of a single family. Attempts to challenge these actions through online petitions failed despite garnering over 1,000 signatures.